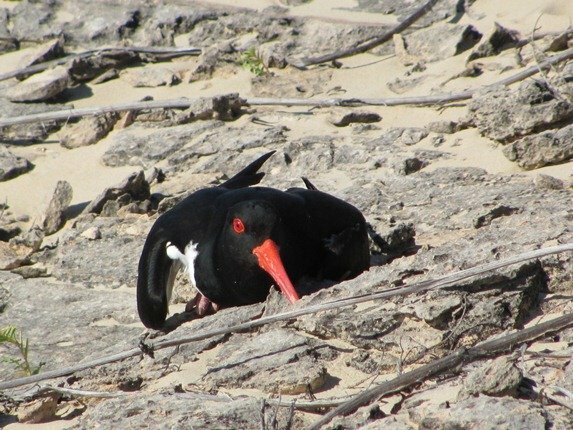 After 28 days of sharing the duty of sitting on three eggs we finally had the arrival of our first Pied Oystercatcher chicks for 2012 on Friday August 3rd. 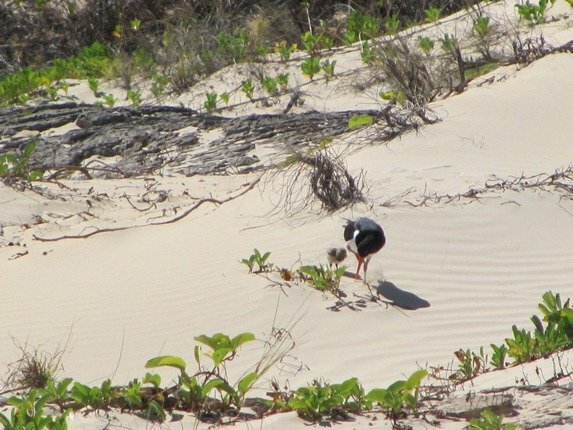 It is unusual for three eggs to be laid here in Broome and many eggs do not even hatch due to predation each season. It is at the same time of year that the migratory shorebirds that spend part of each year in Broome are also breeding, but in the Arctic. 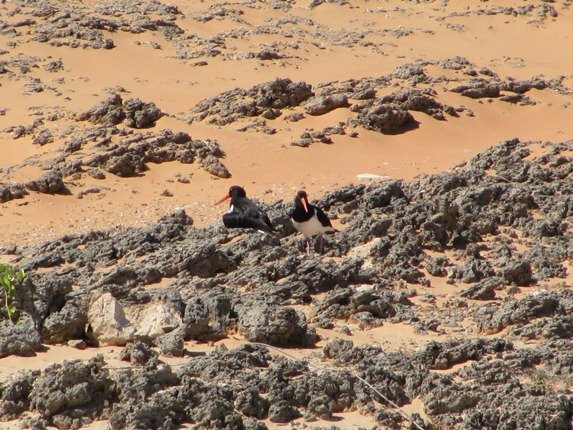 The adult Pied Oystercatchers had spent the previous 28 days chasing off Black Kites and Brown Goshawks, but it was far from over yet. The chicks need to survive the elements for 35 days before they are able to fly and escape danger and until then they will rely on their parents and camouflage. By Saturday morning all of the chicks were out of the nest and the eggshell removed. The adults shaded them in the rocky outcrops nearby and they are well camouflaged in that area. I observed them from a distance with binoculars and it was interesting to see the eagerness of the chicks to explore. They would stumble and fall amongst the rocks and the adults tried to prevent this and each chick that moved was rounded up again. There was little movement by the family during the heat of the day except to fly to the shoreline for a drink and to cool their feet. 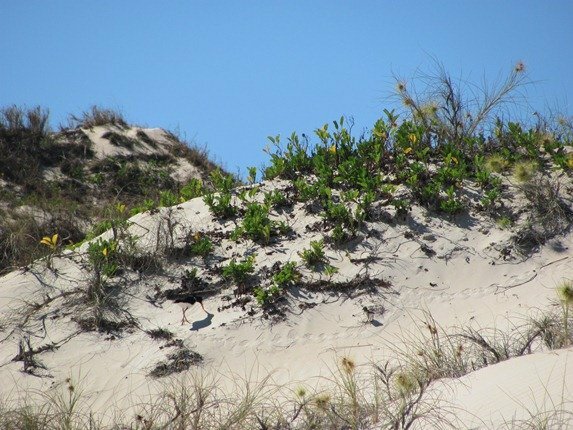 By the next day they had moved through the dunes towards the front of the beach and were allowed to explore. They were following the adults closely and following instructions. The vocal sounds differ considerably and you soon learn what they are instructing the chicks to do-hide or follow. 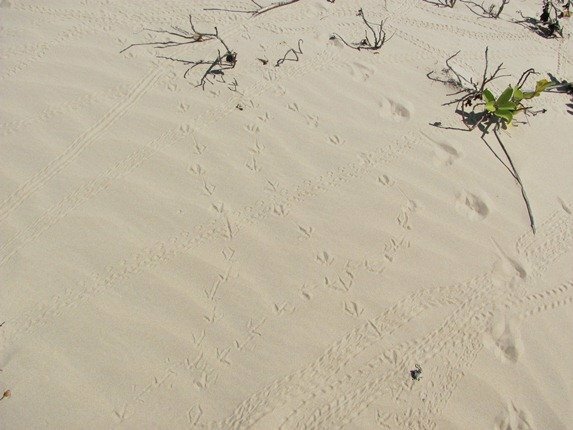 Pied Oystercatcher and one chick in its footprints in the dunes-note the little shadow! During the heat of the day and when the tide was in and they could not feed they brought the chicks right down to near me with my bike and binoculars. They rested in the soft sand at the highest tide mark and I was expecting they may take the chicks closer to the sea. They sheltered the chicks under their wings and when there are only two chicks one parent can do this, but with three it seems to be more of a shared duty. However, being the weekend, there were dogs on the beach and they decided to move away after a short period of time. One parent called and they followed and tried to all fit under the wings and amongst the beach plants. 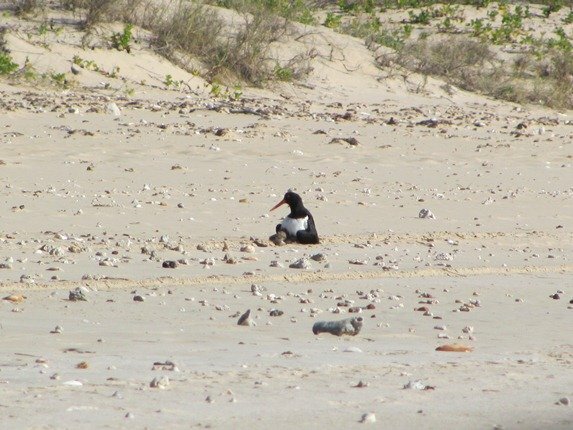 There was an interesting situation when a dog innocently rushed to the soft sand at the top of the beach and it was totally unaware of the Pied Oystercatchers. The birds immediately flew down towards the dog and tried very hard to tease it and make it follow, but it had no intention in doing that. 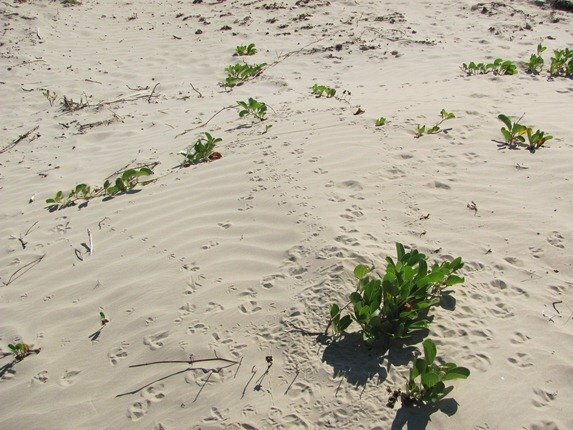 The dog had one thing on its mind-get covered in soft sand and then leave. The poor birds seemed quite put out that they could not influence the dog at all and on other occasions I have seen it work very well and the dog has followed the birds. As the tide dropped the birds started to take it in turns to collect food from a nearby reef and it took about 8 minutes for each trip. They then suddenly called and I realised it was time for the family to move again. It is extremely useful that they call, but I was in a predicament as my bike was blocking some of the best views! They walked the chicks down to the beach and into the tyre tracks left by the beach inspector and once again there was a bit of an issue in trying to fit three chicks under two wings. 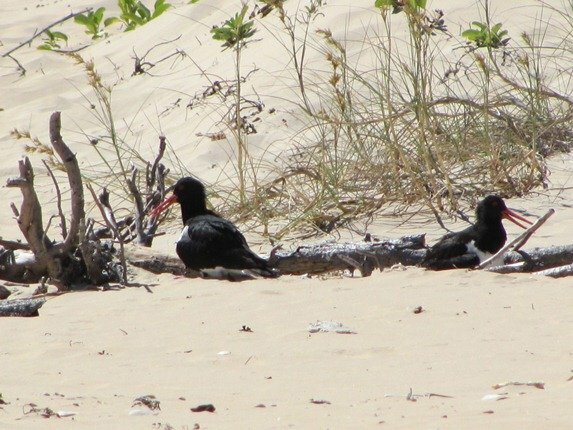 Pied Oystercatcher trying to shade three chicks under two wings! 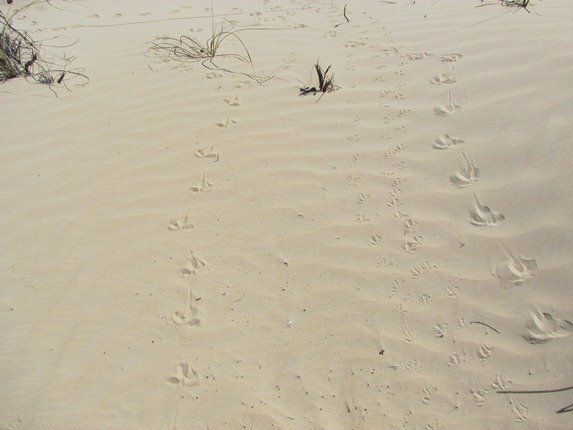 The adults covered their risks by leaving one closer to the dune system and the other walked the chicks along the wet sand and then back into the dune system further down. The following day I set off to see if they had continued on all the way to the reef, but I was doubtful due to the large tides and previous years they have delayed the move. 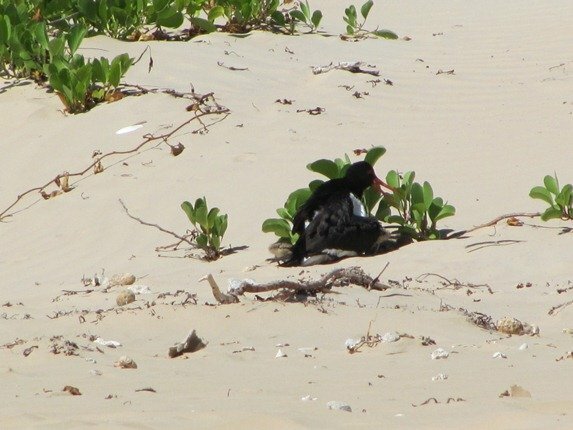 They had nested closer to the reef in earlier years, but the construction of a beach shelter just prior to the breeding season one year changed their decision on a suitable nest site. 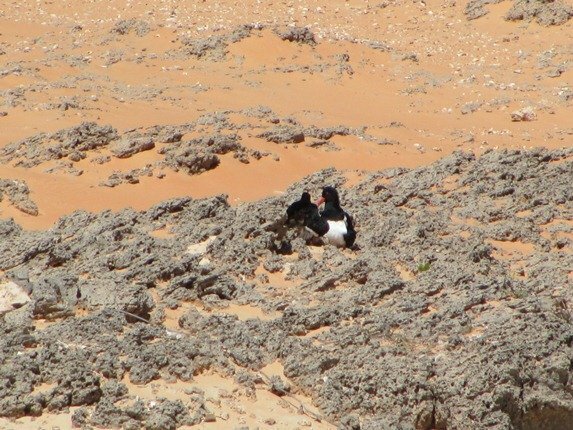 It is extremely easy to follow a family of Pied Oystercatchers through the dunes when there has been no wind and I was able to see where they stopped and rested over the day since I had last been there. I was carefully walking along following tracks and all of a sudden I was within metres of the family by accident. They were well hidden in a gully and neither party saw each other until the last minute. I jumped and the adults let out an alarm call and one went flat. I quickly took a photo and returned to the wet sand. The other adult had the three chicks running along behind and all was well. They had covered over 4 kilometres in the day since I was last there and had evidently been at the sea shore during the lower tide by the footprint evidence. It was a very foggy and damp night on Wednesday and when I returned a day later I discovered there had been three sets of small prints in the early dampness, but by the late afternoon there was only one chick remaining. Nature is cruel and I see this year after year. The parents are being extremely attentive to their one remaining chick and it is following very closely. I don’t know what predated their chicks, but I could see it was not easy to protect and feed three chicks over the days that I observed them. 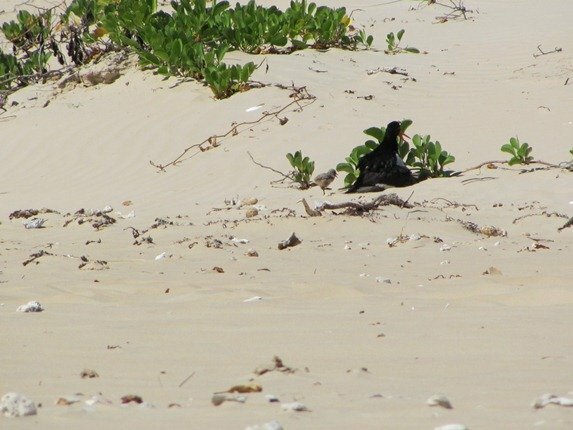 They are feeding the chick on both creatures from the reef and also creatures in the dune system and I just have to hope it makes it through the next month and it will be flying free. 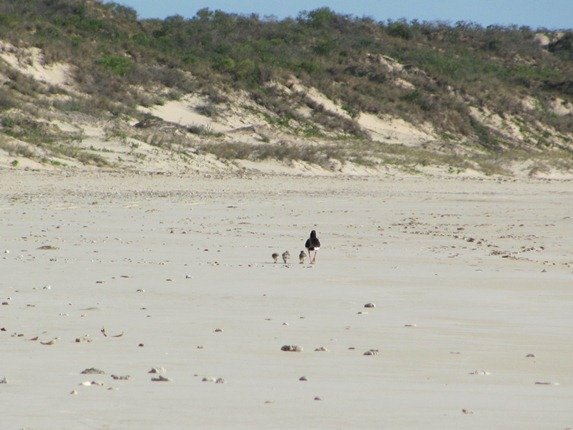 They successfully raised a chick last year after two breeding attempts totalling 6 eggs and that chick moved off to join the big flock in Roebuck Bay after a few months. Thank you, Clare, for a really beautiful post, with fabulous photos and incredible suspense! I love seeing the chicks shaded by the parents, and also walking alongside the parents on the beach.